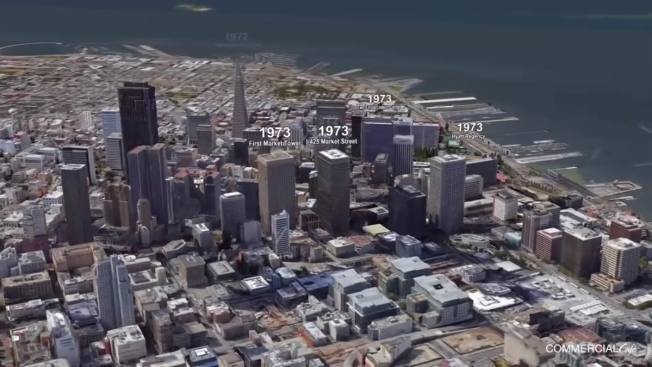 San Francisco’s skyline has continuously evolved over the years, and thanks to a new 61-story building, the city’s horizon has once again been altered forever. The 1.4 million square-foot Salesforce Tower is now the tallest structure in San Francisco and the second-tallest building west of the Mississippi River, following L.A.’s Wilshire Grand, COMMERCIALCafé reports. At 1,070 feet above ground, the tower is undergoing the final stage of construction on 415 Mission St where companies CBRE, Accenture and WeWork will join the cloud computer company. Developers are finishing up the companies’ buildout while Salesforce has already started moving employees into the building, The Examiner reports. San Francisco’s downtown area has not always been graced with cloud-reaching buildings. In 1853, the Montgomery Block was the first building to shape San Francisco’s skyline at just four stories. It was followed by the San Francisco Chronicle in 1890 which in its time, was the tallest building in the West Coast. In 1922, the Standard Oil building rose 22 stories and became the tallest in the city. It kept its title for decades until the 60’s, where a reported 40 new buildings were built. In 1972, the Transamerica Pyramid was built and remained the tallest building in the city for more than four decades, until Salesforce took its place in 2018.